Our POD service allows us to print the latest SNC on site. It is printed in its exact color and size, we can fulfil any urgent orders in the quickest time possible. They are up to date with the latest safety critical information. Within 7 minutes, a chart can be printed, folded and stamped. POD charts can be printed for the purpose of framing without folds. POD orders can not be returned. Chart corrections is time consuming and crew members doesn’t always have the time or space to do it. That’s why you can rely on us to do it. As experienced chart correcters, we list all the charts, check for new editions or withdrawn charts. A quote is issued and once it is accepted, we apply the corrections to the latest NM’s. As we are a small team, we only apply the 5 last corrections. Any charts with more tan 5 corrections will be replaced. Any damage chart will be notified and changed if accepted. 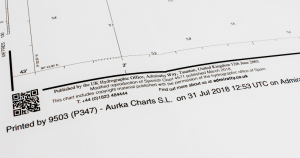 To ensure that your chart will stay up to date, we give you the option to receive corrections (tracings and notices to mariners) via email for the charts carried on board. An Excel spreadsheet is created with the list of charts carried on board and corrections are sent with the spreadsheet updated and the notices to mariners. By opening the spreadsheet, the charts affected by correction are marked with the nm nº. printing the tracing and applying the correction is all you have to do! 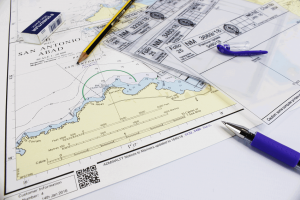 You can leave your charts in long term storage with us if they are not needed on board. They can be maintened up to date (once a month for example) to ensure that all the corrections are applied and that they are still usable when needed. AeNP are becoming more and more used by crews but the installation can be tricky sometimes. That’s why we offer you the possibility to help you install them on your computers. We ensure that the software are well installed, operational and updated. We also give help over the phone. We will always do our best to help. We deliver and pick up your charts or any order in palma bay, Portals or Port Adriano. For further locations on the island, local courrier service can be used.